Again I was overly eager and did not take a before photo. Bad, bad, bad. Again, please use your imagination. 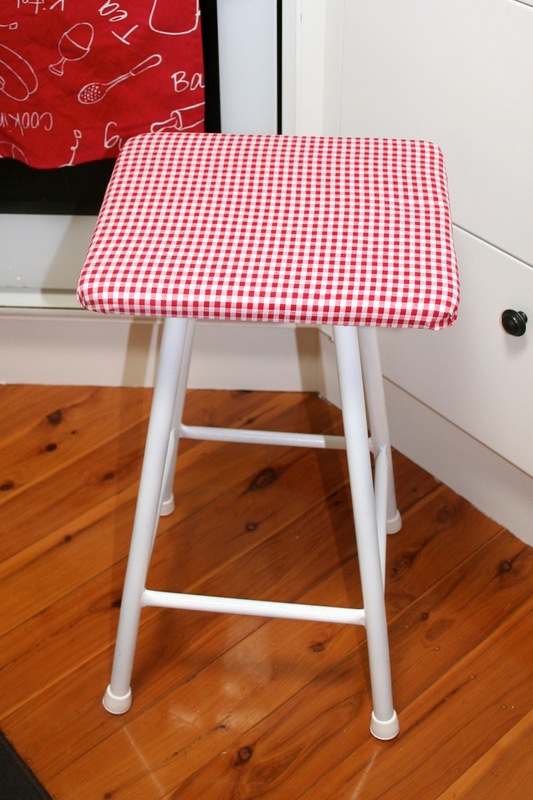 I started out with a very old stool. The seat was wooden with lots of paint stains. The legs were a grey rusty metal. This piece was crying out for a make over! And being the nice person that I am, it was lucky enough to come home with me for the bargain price of $5! Again, there was some trial and error. Firstly I unscrewed the seat off the legs and sanded it. I then applied a lovely red coat of paint - and hated it! Time to cover instead. So I selected a cute scrap of red and white check fabric from my fabric stash (total cost - zero) and with the help of my glue gun, attached a layer of padding and then covered it with my super cute fabric. I sanded the rust from the legs and applied 2 coats of spray paint. PLEASE LEAVE A COMMENT SO I KNOW YOU DROPPED BY!